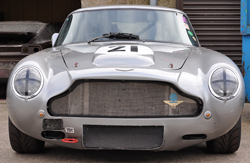 For over 25 years now, Goldsmith and Young has been preparing Aston Martins for racing, either nationally with the Aston Martin Owners Club and other UK based organisers, or internationally in Europe and beyond. Should you wish to participate in this exciting world, we would be happy to provide you with an estimate of cost for preparing your car, and then transporting it and running it at the race meetings on your behalf should you so wish. Whether you want to dip your toe in the water and prepare a road car for standard class F.I.A. racing or go fully modified with a lightweight car, Goldsmith and Young can prepare it for you. The Aston Martin Owners Club (visit the AMOC website) run a full competition calendar of hill climbs, springs and circuit race meetings both in UK and abroad, which the Goldsmith and Young racing team have been participating in for many years. There are also many other series where our cars are welcome such as The Masters Series, Classic Le Mans, etc. Currently we run our own lightweight fully modified fuel injected DB6, which is the only one like it in the world, and are also preparing a 1952 DB2/4 and a 1971 V8 for F.I A. and club racing. We are also able to organise the issuing of Historical Technical Passports issued by the F.I.A. which you will require for most forms of European Historic Motorsport.